Roddam Spencer Stanhope 'Why seek ye the living among the dead?’ St Luke 24 v5 1870s-90s. Stanhope shared numerous connections with Cameron. While you may not be familiar with her name or work, Julia Margaret Cameron (1815–79) was one of the most important photographers of the 19th century. The Gallery is presenting an exhibition of her photographs from the Victoria and Albert Museum, London, and there are many links – both social and artistic – to artists and works in our collection. Cameron’s photographic practice was inextricably linked to her social network and the art of her contemporaries. 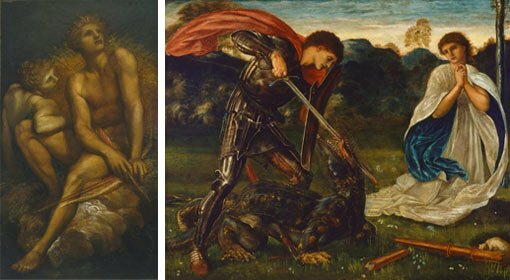 She frequently enlisted fellow artists, poets and public intellectuals as portrait subjects or as characters within allegorical scenes and some, including the artist George Frederic Watts, served as artistic mentors. Re-locating from Calcutta to England in 1848, Cameron quickly became associated with Victorian England’s intellectual and artistic elite. Her sister and brother-in-law, Sara and Thoby Prinsep, held a regular salon at their London residence, Little Holland House, which attracted eminent cultural figures including Henry Taylor, George Eliot, Edward Burne-Jones, William Holman Hunt, Thomas Carlyle and John Ruskin. The salon was focused around Watts, who lived with the Prinseps. It was here that Cameron met many of her subjects and even used the house as her photographic headquarters at the beginning of her career. Watts was Cameron’s primary aesthetic advisor and she affectionately referred to him as ‘the Signor’. In their correspondence, the two often discussed her work and the development of her stylistic signature. She trusted his advice and sought his critique. Watts painted allegorical scenes but also firmly believed in the broader cultural value of portraiture and its ability to convey introspection and illustrate the personal temperament of a sitter. His veneration of the portrait genre informed Cameron’s approach to photography and her own proclivity for hero worship. As she admitted in her 1874 memoir, her portraits aimed to capture ‘the greatness of the inner as well as the features of the outer man. The photograph thus taken has been almost the embodiment of a prayer’. Watts furthered the artistic career of Sara and Thoby’s son Val and used their other son, Arthur, as a model. It was Arthur who modelled for Watts’ Artemis and Hyperion c1881, which is in the Art Gallery of NSW collection and on display in the 19th-century European galleries. The painting depicts a scene from Greek mythology featuring sibling deities. Mythological subjects also regularly appear in Cameron’s work. Cameron was preoccupied with Biblical narratives and Arthurian legend, and this resonated with the thematic concerns of the Pre-Raphaelites. The Pre-Raphaelite Brotherhood and their followers rejected the conventions of Academic painting. Many of them attended the salons at Little Holland House and were part of Cameron’s extended social network. Also in the 19th-century European galleries, you can see paintings by Sir John Everitt Millais (a founding member of the Brotherhood) and Sir Edward Burne-Jones (a leading figure among the second-wave Pre-Raphaelites) as well as works by Roddam Spencer Stanhope and John Melhuish Strudwick. Stanhope was closely affiliated with the Pre-Raphaelites and attended Oxford with Charles Dodgson (aka Lewis Carroll), who photographed Cameron before she took up photography. Stanhope became Watts’ pupil in 1850 and regularly spent time at Little Holland House. 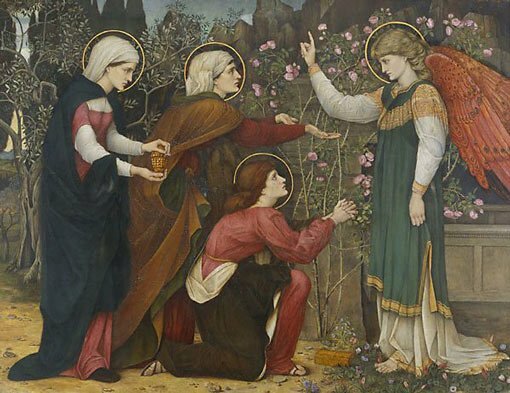 Once he had established his own studio, Stanhope employed Strudwick, who also worked for Burne-Jones (a relationship that greatly influenced Strudwick’s style). A line of association also links the American neo-classical sculptor Harriet Hosmer to Cameron. Hosmer’s Beatrice Cenci (1857) is a melancholy and intimate portrayal of a tragic historical figure that fascinated Cameron. Beatrice Cenci, a 16th-century Italian noblewoman, was executed after she arranged for her abusive father to be murdered. Both Cameron’s 1866 photograph Beatrice and Hosmer’s sculpture are based on a painting then attributed to Guido Reni (a engraving of which was owned by Cameron’s neighbour and close friend Alfred Lord Tennyson). Hosmer’s sculpture was displayed in the 1857 Royal Academy Exhibition and it is very likely Cameron saw the work, as a miniature of Cameron’s daughter appeared in the same RA exhibition. Hosmer was a close friend of poet Elizabeth Barrett Browning whose husband, Robert Browning, was photographed by Cameron in 1865. While Cameron’s aesthetic wasn’t emulated by photographers during her lifetime, either directly or indirectly, her work has gone on to inspire later artists and inform their own experimentation with the expressive potential of the medium. We know that the Australian photographer Harold Cazneaux owned a copy of Alfred Stieglitz’s photographic journal Camera Work no 41, which contained a photogravure of Cameron’s Sadness (1864). Cazneaux’s early portraiture betrays hints of Cameron’s influence, particularly in his tender photographs of children and young women. 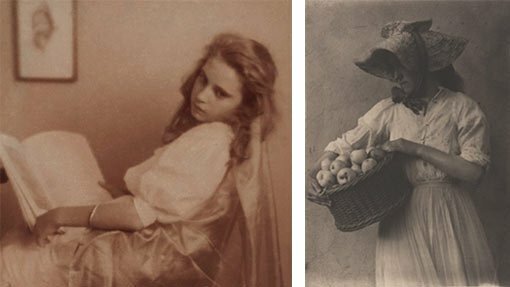 Another Australian pictorialist, Frederick A Joyner, alludes to the graceful strength of Cameron’s female protagonists in his portraits of women in pastoral settings. A display of Cazneaux’s and Joyner’s work is currently on show in the 20th-century Australian galleries, and you can visit all these Cameron-connected works as part of a self-guided tour.